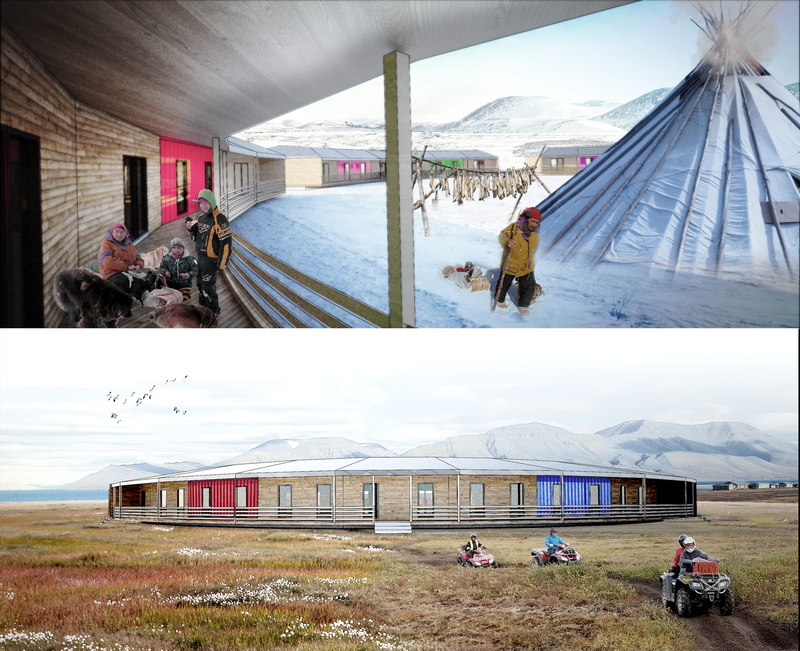 Unpacking community is a housing project proposal which lends the opportunity to reflect on human settlement in Northern Quebec. The circular footprint of the building allows for 12 to 16 through-units to be organized in a huddled way in which each unit is accessible from the territory (front yard) and from the community space (back yard). Screened-in verandas on either side allow for semi-private activities to take place, such as storing seal-skin clothing and boots, hanging meat, skin or vegetables to dry. As the base building materials (structural, electrical, plumbing elements, envelope materials and basic finishes) are included in the delivery of the container, finer details and finishes may be completed with the use of local materials such as spruce, animal skin and crushed stone. Water collection and wind-generated energy are also part of the base building. Once unpacked, the container bin is insulated and becomes a structural and spatial organizer of the building. The floor plan of each unit allows for a flexible layout, adapted to each family’s specific needs. Units may be doubled up to contain 4 separate bedrooms. Once a circle community is completed, others may be built around it, the layout may depend on topography, sun/wind direction and acces to water.